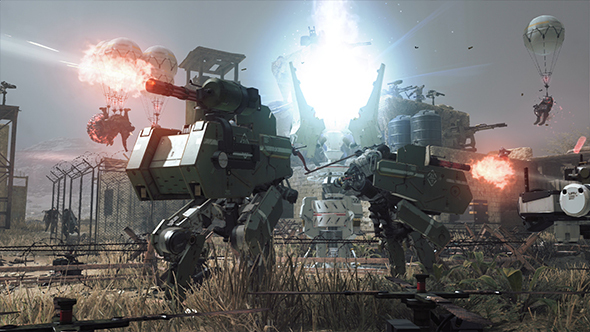 We already knew Metal Gear Survive was going to have microtransactions, but now Konami are charging players for extra save slots. Love (is not) a battlefield. Konami reserves the right to ban your love affair in Metal Gear Survive. Originally reported by PC Gamer, creating an extra save slot, and therefore a new character, in Metal Gear Survive will cost you 1000 SV coins. However SV coins (aka Survival Coins) are bought with real money, and there’s no option to just buy 1000 coins at a time – instead, the easiest way is to purchase 1150 coins which costs $9.99. In other words, it costs nearly $10 to create a new character save file in Metal Gear Survive. So how does it work? 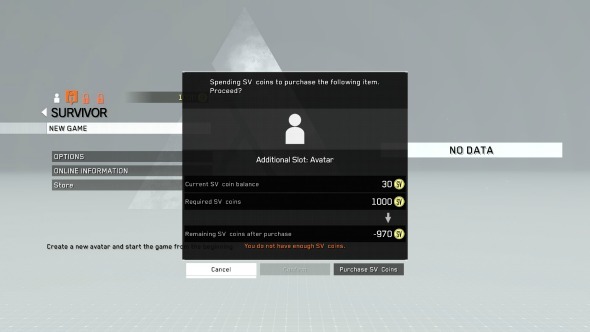 If you already have a save file in Metal Gear Survive, and click to start a New Game,” you will be greeted with a pop-up prompting you to purchase the slot using 1000 SV coins. You are given 30 SV coins as a daily login bonus, but to collect enough to earn 1000 coins would mean logging in for 34 days. Alternatively, you can save a cent buying two sets of 550 coins or save $0.10 buying ten batches of 100 coins, but this still doesn’t offer much change from $10. So make sure when you make your character in Metal Gear Survive that you like them, because the alternative is deleting them or splashing out $10 for a new one.